Once they’re mobile, little ones’ favorite activity is getting into everything. No cabinet, drawer, or toilet is safe from prying hands. We’ve got the list of the best products to keep your baby (and all your stuff!) secure. Once your baby is on the move, there’s no stopping their curiosity! To keep your little one out of trouble, you’ll need to baby-proof your home. You might have already added cushioning to sharp objects, but proper baby-proofing goes far beyond that. Cabinet, window, door, and toilet locks are also essential to keep your baby from getting hurt. To help you find the best baby locks for your home, we did some research. Below, you’ll find top toilet, window, door, outlet, and cabinet locks to keep your baby safe. The BabyKeeps Child Safety Locks top of our list because they’re affordable, discreet, and easy to install—plus, they work for babies and toddlers. 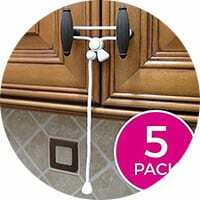 These childproof locks are attached with 3M adhesive to each door of your cabinet (or the bowl and lid of your toilet) and have a strong strap that holds the cabinets shut. When you want to get in, you simply press the release button, and the strap comes loose on one side. They even come in different colors, so you can babyproof without ruining the look of your room. The biggest downside is that they’re attached with adhesive, so it is possible they could eventually be pulled free by persistent hands. And when you’re ready to take them down, you’ll have to clean the residue on every cabinet door. The Munchkin Xtraguard is another adhesive-based, strap-across babyproof system that we love. This one features a dual button release which makes it difficult for even older toddlers to figure out. A little bit larger than other babyproofing options, this one is a bit less discreet but can be used on cabinets, refrigerators, and toilets. 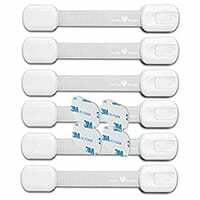 The adhesive backing means you won’t have to use tools to install it, but you’ll also have to deal with cleaning off the sticky residue when you no longer need the latches. The Jambini Magnetic Cabinet Locks are our favorite magnetic lock system because they do almost no damage to your cabinets, are completely invisible, and don’t require tools to install. These locks work by attaching a latch on the inside of the cabinet that will hold it shut until you put the magnet-based key on the outside. This magnet will release the lock and allow the cabinet to be opened. If you know you’ll be in and out of a particular cabinet often, you can temporarily unlock the latch, so you won’t need to use the key. Make sure you keep the key in a safe place far away from any little ones who might wander off with it, or you’ll be stuck with a lot of cabinets you can’t open! Mommy’s Helper Outlet Plugs are another must-have babyproofing product. Outlets pose a risk to toddlers and crawling babies because of their intriguing shape and their eye-level position. Putting a finger or toy into an outlet could really hurt your baby and cause electrical problems for your home. The outlet covers are great because they keep little hands and fingers safe but are easy for you to remove when you need to plug something in. 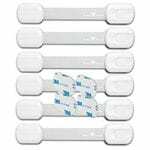 Plus, they come with more than 30 plugs in a pack, making this one of the most affordable babyproofing options. These latching locks are also attached with adhesive (no tools required!) and are completely invisible. Two pieces, a hook and a catch, are secured to the inside of your cabinet. To open, you pull the cabinet slightly ajar and then push down on the hook to release it. There’s no button to push or key to lose. These locks are great for keeping little ones out of drawers too. However, they can’t be used on refrigerators or toilets, so if you’re looking for a one-stop babyproofing solution, this isn’t it. 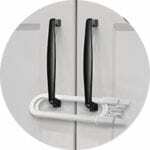 Kiscords Baby Safety Locks are a great option for temporary babyproofing that won’t leave a mark on your cabinets. 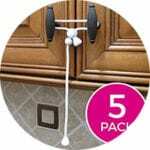 Similar to a drawstring on a hoodie, this cord wraps around each handle of your cabinet doors and then is tightened up to hold the two doors closed. Each end of the string comes threaded through a button that slides up and down, tightening or loosening the lock on the cabinet. One downside is that these locks can be more difficult to open and relock than other options. They also work only on cabinets with handles. 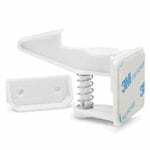 This latching babyproofing system allows for invisible installation with either an adhesive or screws. This makes it a great choice for parents who have lots of little ones and will need cabinets locked for a long time. They’ll work in any direction with cabinets and drawers. But these latches are a little bit cheaper than other latch systems and might not be as durable if installed with adhesive rather than hardware. The Sliding Cabinet Lock uses a U-shaped piece of plastic, threaded through cabinet handles, to keep doors shut. 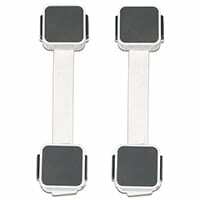 It has a securing piece that slides off and on the ends of the U when the release is pushed. 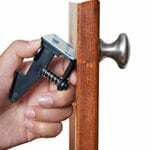 This lock is great for a quick and easy install that won’t leave any marks or damage your cabinets. They can be a little trickier to open, though, and they’re not the most discreet childproofing solution. Also, if you lose the securing piece, these locks will be useless. Safety 1st, a top brand for many baby items, has a great magnetic locking system. It works the same as other magnetic locks, hidden behind cabinet doors and requiring a magnetic key—and it can also be set to stay unlocked. This system is a little pricier than other magnetic locks, but it does have a hardware option for cabinets made of particle board, or anywhere you want an extra-secure bond. I want to uninstall my cabinet locks. How do I get the adhesive residue off? 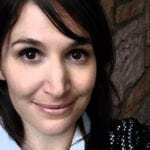 Most babyproof cupboard locks will say that the adhesive leaves no residue. However, depending on how long the lock is in place, you’ll probably be dealing with some sort of residue. The best way to clean it off is with a solvent. 3M sells a product specifically for removing the residue. Many homeowners swear by a little squirt of WD-40, hand sanitizer, or Goo Gone. Don’t forget to wipe the solvent off your cabinet when you’re done! My cat constantly gets into our cabinets. Will childproof locks work for nosy animals? Yes! Quite a lot of four-legged family members need to be protected from their own curiosity. Whether it’s a trash can you need secured or a toilet lid you want to keep down, most babyproofing products do a great job of keeping animals out too. I lost my magnetic key. What do I do? The easiest thing to do is buy a replacement key. If you can’t find one, you may need to buy another magnetic babyproofing system. However, some parents have used fridge magnets to get the job done! I don’t have the time or money to babyproof everything. What should I prioritize? Parents know that every penny counts. When it comes to babyproofing, focus on everything that’s at your baby’s eye level, especially if it’s something that could cause them long-term harm (like electrical outlets or cabinets full of cleaning supplies). Should I have a professional install my babyproofing? For most homes and most babyproofing products, self-installation is fine. There are companies that will come through and do it for you, making sure no safety stone is unturned, but most parents opt for a DIY approach. Of course, no matter who installs your products, you’ll still need to keep an eye on your little one. There’s no substitute for you! To evaluate babyproofing systems, we installed and tried a few, read user reviews, and talked with parents about what worked for them. For more information on how we evaluate products, see our methodology.